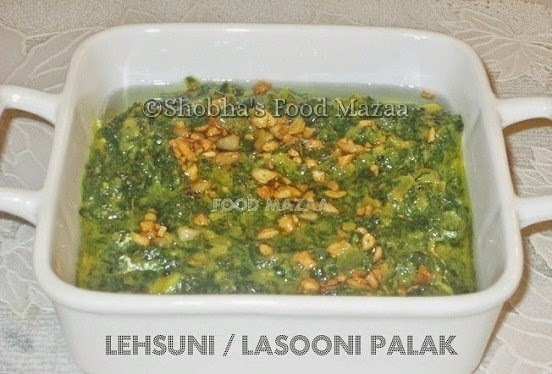 Pesto sauce is made with basil leaves and walnuts or pine nuts, either one can be used. I made with walnuts as they are my hubby's favourite among the dry fruits. Any kind of pasta can be used in this preparation. 1. In a pan pour 5-6 cups of water. Add salt and a tbsp of oil. Boil the pasta until almost done but not mushy. Drain and run under cold water. Pour a little oil to keep them separate. 2. Grind the basil adding walnuts, vinegar, garlic, cheese and add the oil little by little while grinding. 3. In a pan add a little oil and pour the pesto sauce. Stir it for half a minute. 4. Tip in the boiled pasta. Mix a spoon of cream and temper with salt and black pepper. If you want a thinner consistency you can add a little milk. Garnish and serve immediately. Note: You can substitute the cream with milk if you want it lighter and skip the cheese in the pesto sauce. Just use a little for garnishing if you like. 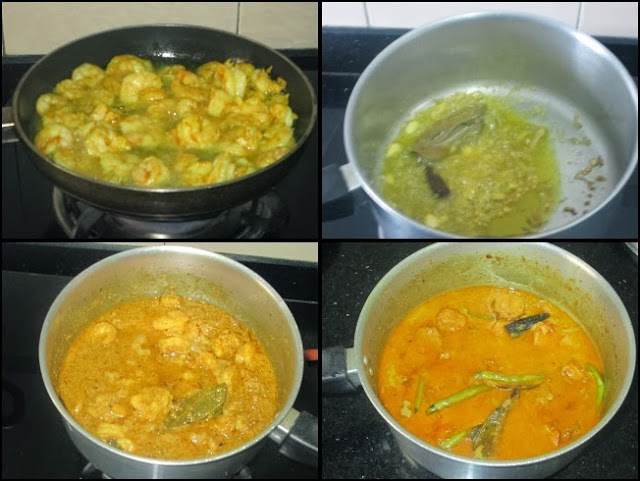 I was always fascinated by the Bengali style of cooking veg and non veg dishes. Bong Mom's cook book caught my attention recently and before I could buy it I was lucky to win the same in one of the blog events hosted by Cooking 4 all Seasons. 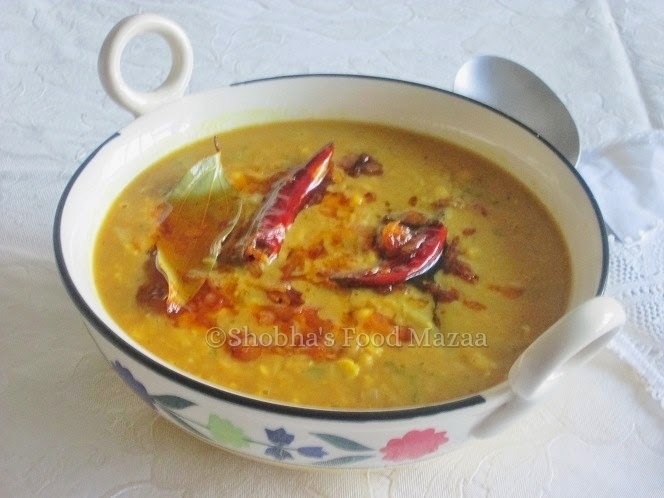 Today I have tried out a simple Chholar Dal recipe. 2. Pressure cook dal with 2 cups water adding salt and turmeric powder. The lentils should remain seperate. Avoid making them mushy. 3. Heat oil in a frying pan. Add the whole spices first and when they leave an aroma add the asafoetida and the chopped onion, ginger and garlic. 4. Fry until the onion becomes slightly brown. Now add the pureed tomato and the spice powders, salt and sugar. Saute until the oil separates. 5. Add the tempering to the cooked dal. Add water according to the consistency you desire.Bring to a boil. Note: Adjust the seasoning according to your preference and you may skip the sugar if you want. 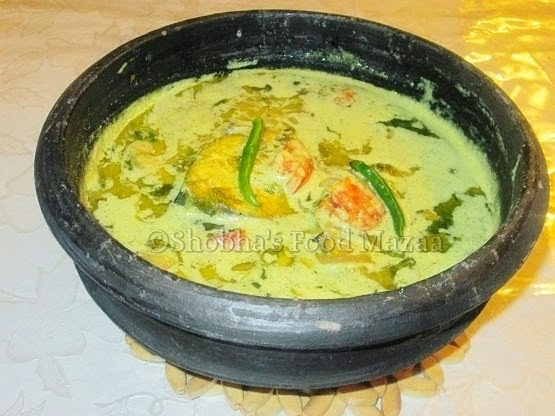 This is a Traditional Bengali recipe, prawns cooked with poppy seed paste ( Posto) and thickened with coconut cream. 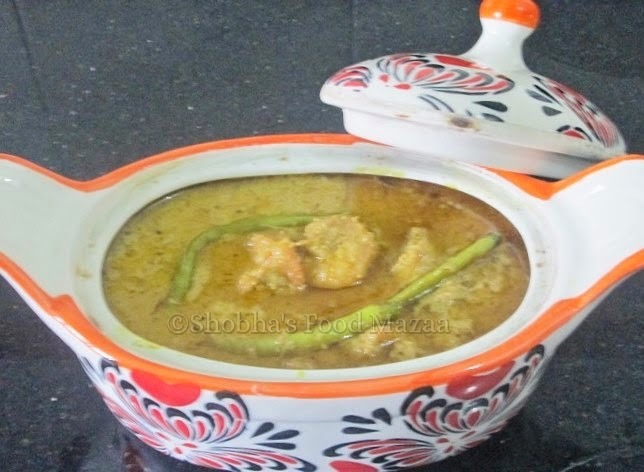 Bengali posto dishes are very delicious specially when we use the mustard oil for cooking. You can also prepare fish or vegetables following the same recipe. Prawns being my personal favourite I have made it with prawns today. 1. Clean the prawns. Retain the tail if you like. Marinate them with turmeric and salt. 2. Grind the onion, 2 green chillies, ginger and garlic to a coarse paste. 4. In another pan heat the remaining mustard oil and add the cinnamon stick and bay leaf. When they give out aroma, add the ground onion paste and saute until it dries up. 5. Now tip in the fried prawns and saute for a few minutes. 7. Finally stir in the coconut milk and garam masala powder. Bring to a boil until blended and cooked. Dear friends I have reached my 600 th post on the auspicious occasion of Diwali. 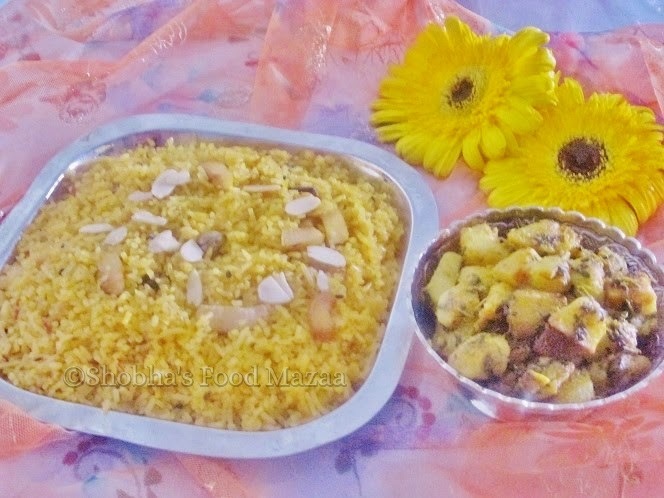 Today I am sharing the recipe of Gur Ji Tehri, which is sweet jaggery rice. 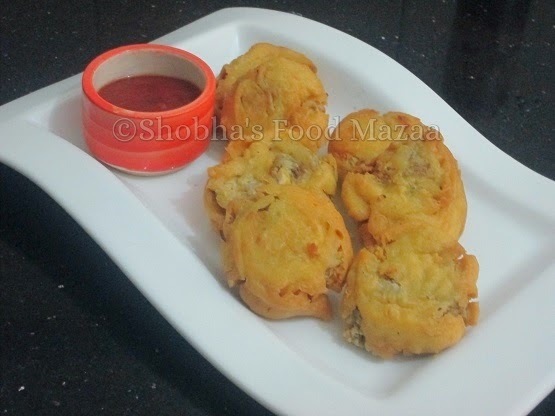 Now this can be made with sugar or jaggery. 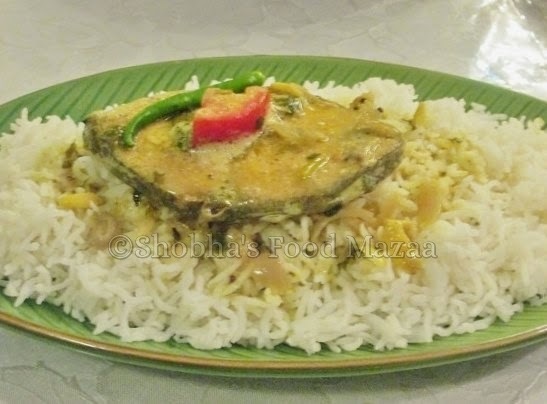 Tehri is made in all Sindhi homes on auspicious and festive days. It is usually served with Sai Bhaji or any kind of Aloo preparation.I have served it with Methi Aloo which is my hubby's favourite. Chopped almonds /pistachios for garnishing. 1. Melt the jaggery in one cup of water and discard the impurities. 2. Heat a spoonful of ghee and add the cardamoms, coconut slivers, cashews, and fennel seeds. 3. When they change coclour, add the rice and saute for half a minute. 4. Add one and half cups water and a pinch of salt. Bring to a boil and reduce the heat. 5. Add the saffron to the cooking rice. 6. When it is half done, strain the jaggery water which would be around 3/4 th cup after boiling. 7. Stir to mix and reduce the heat. Simmer on very low flame to cook. 8. When the water is all evaporated, place the pot on a tawa / griddle for dum. 1. Heat a little oil and saute the onions until light brown. 2. Add the ginger, garlic and green chillies. Saute and add a little water to cook. 3. When done grind it and set aside. 4. Now grate the lauki / dudhi and squeeze out the water completely. 5. Heat oil in a kadai for frying the koftas and mean while mix the besan, salt, chillies, kasoori methi and make round balls or koftas. Deep fry them and set aside. 6. Heat a little oil in a pan and add the onion paste and the tomato puree. Add the spice powders and salt. 7. Saute and add water as per the consistency of the gravy you require. Tip in the koftas and simmer for a few minutes. 8. Stir in the cream and garam masala powder. 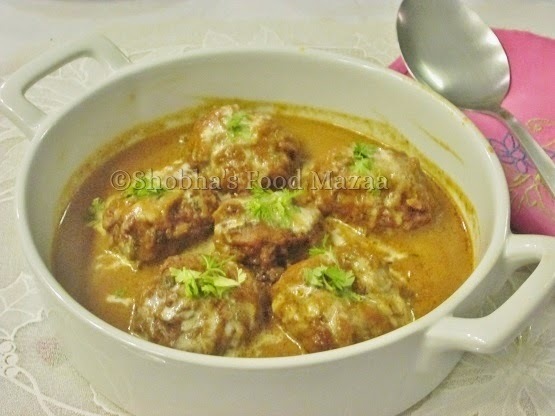 Note: Mix the kofta ingredients just before frying them as the lauki leaves a lot of water. This is one of the most popular salads. 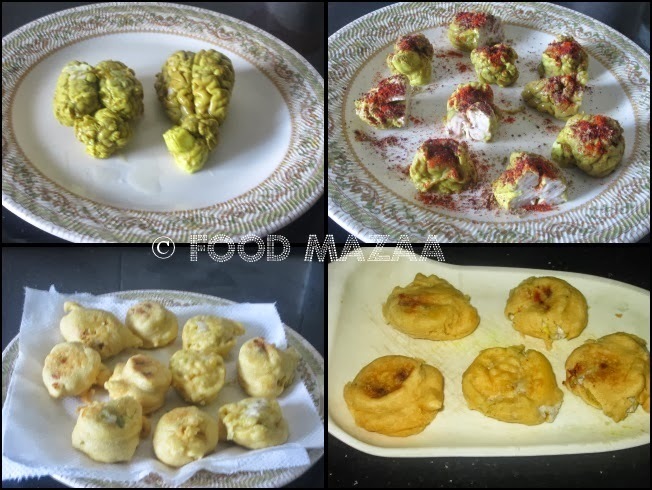 It is very simple and you can easily make it at home. This fruity salad is a treat in summer. Black pepper ..... freshly ground. 1. Toast the walnuts and break into pieces. 2. Wash and cut the apples into pieces with the skin. Squeeze lime juice over them. Chop the celery finely. 3. Whisk together the mayonnaise, yogurt, honey and season with pepper. 4. 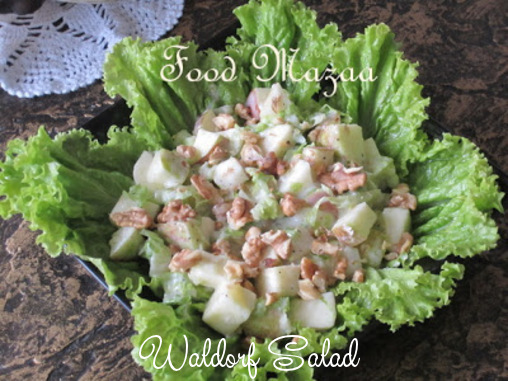 Toss the apple pieces, walnuts and celery in the mix and refrigerate. 5. Serve chilled on a bed of lettuce leaves. You can add grapes or raisins to this salad if you like. Kasoori methi ... dried and powdered .. to sprinkle on top. 1. Shred the cauliflower finely and put it in hot water to remove the impurities. 2. Boil the green peas and set aside. 3. In a pan heat oil and add the finely chopped onions. Saute until brown. 4. Add the ginger, garlic, green chillies, tomatoes and a little water to cook. 5. Now tip in the cauliflower and start sauteeing until you get a nice brown colour of the keema.You can sprinkle a little water if needed. 6. Add all the spice powders, salt and coriander leaves. 7. Finally add the green peas and stir it. 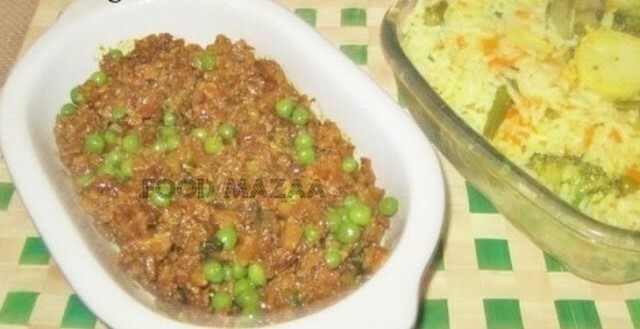 Tip: Adding boiled green peas in the end gives a better look to the curry. 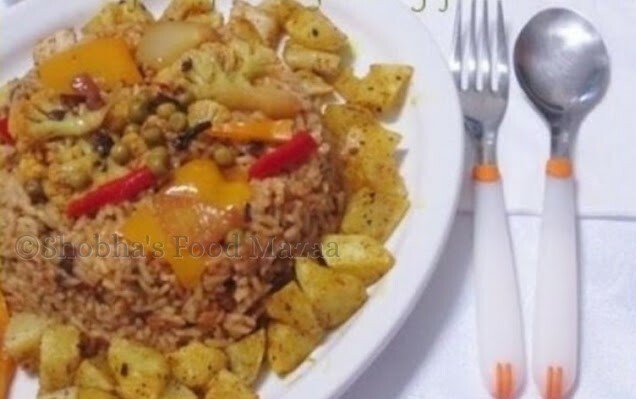 Veg pulao is the most healthiest option for one pot meals.. I keep trying out variations with different spice mixes and masala pastes. 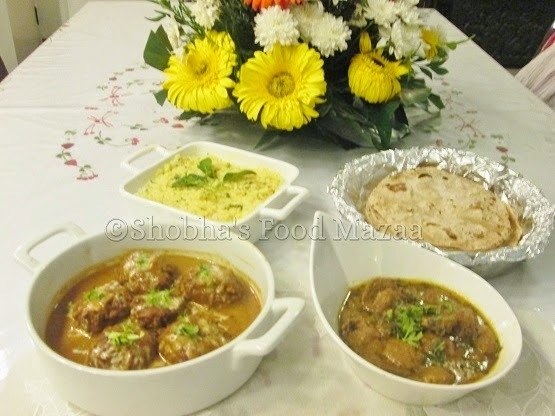 Today's version is with the flavourful Shan Biriyani Masala. I just love the flavours of this powder. 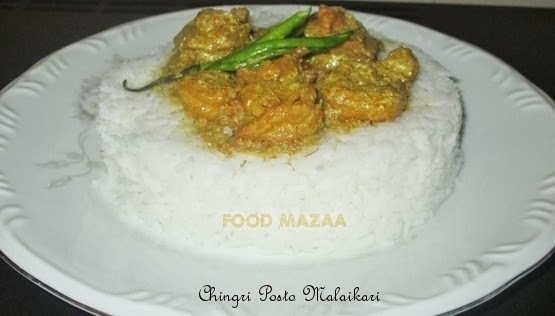 Biriyani Masala... 1 & 1/2 tbsp. 1. Wash the rice and soak it for 1 hour. 2. In a pressure cooker heat oil and add the whole spices, the ginger garlic paste and saute. Add the onions and stir fry till golden brown. 3. Tip in the vegetables,green chillies, tomato, salt, turmeric. 6. Now add the rice and double quantity of water. ( If using Basmati, add a little less than double). Check the salt and close the pressure cooker. 7. After 2 whistles, simmer it a little and close the gas. Leave it for 5-7 minutes before opening the cooker. 8. Carefully seperate the rice with the back of the spoon. I use a chop stick to do this. 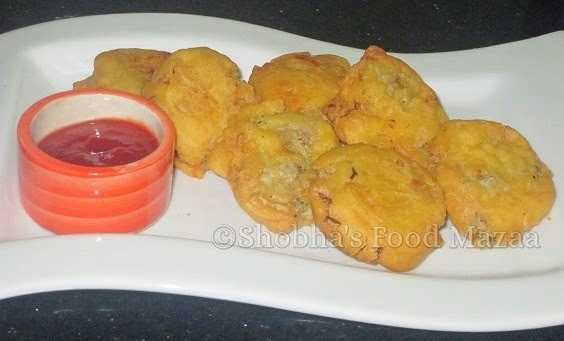 Serve with raita or fried potatoes. 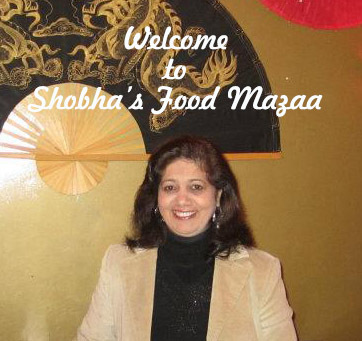 This month I have been paired with Shazia of Cutchi Kitchen in the Potluck Party Cyber Style hosted by Jagruti.. 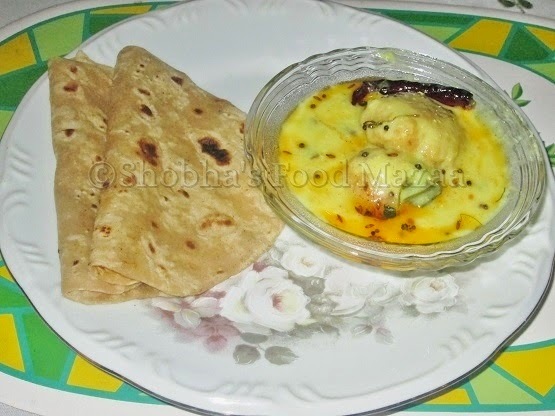 The kadhi is very simple to make and so delicious. We loved it and it is going to be a regular feature in our house. I recommend you all to try it out. Oil .. to fry and for tempering. 1. Soak dals for 2-3 hours. You can soak the dry red chillies with them too. 2. Grind them coarsely without adding water. Add the fennel seeds and coriander seeds while grinding. 3. Mix turmeric powder, salt and baking powder. 4. Make lemon sized balls and flatten them a bit. Deep fry these and set them aside. 6. 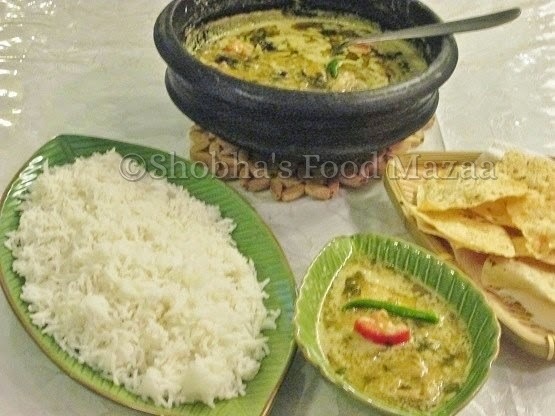 Bring the kadhi to a boil and simmer it. Add salt and turmeric powder and a little sugar if you like. 7. 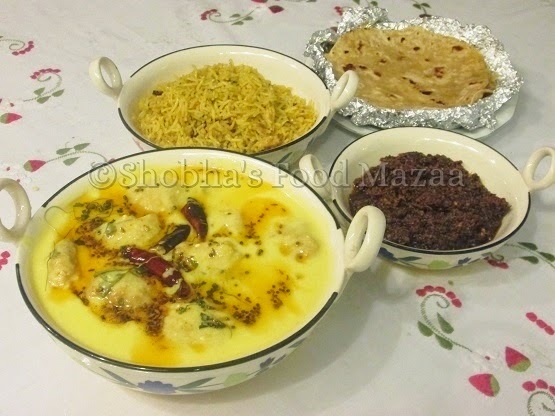 When the kadhi is thicker, tip in the dal fritters and simmer for about 4-5 minutes. 8. Heat a little oil and add the tempering ingredients except red chilli powder. When they crackle, remove from the gas and let it cool a little. 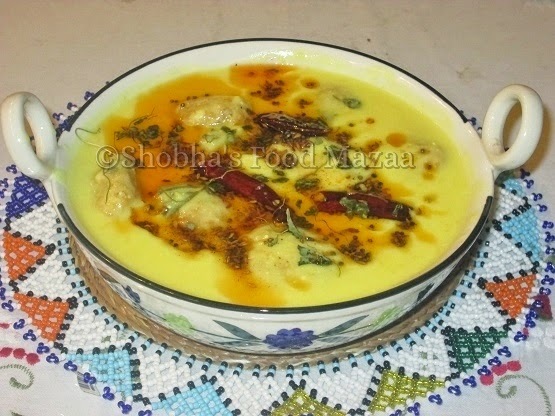 Now add the chilli powder and temper the kadhi just before serving. 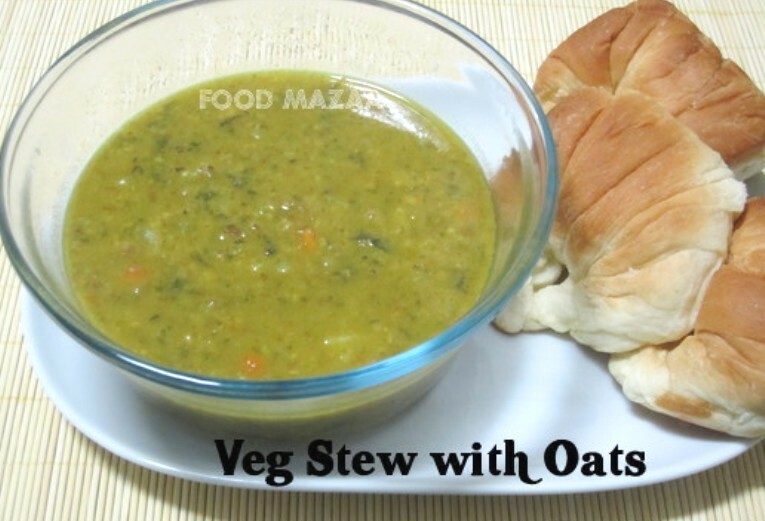 A very healthy and nutritious dish with a combination of vegetables like carrot, potato and spinach.In addition we also have green gram for protiens and all of us know the health benifits of oats. 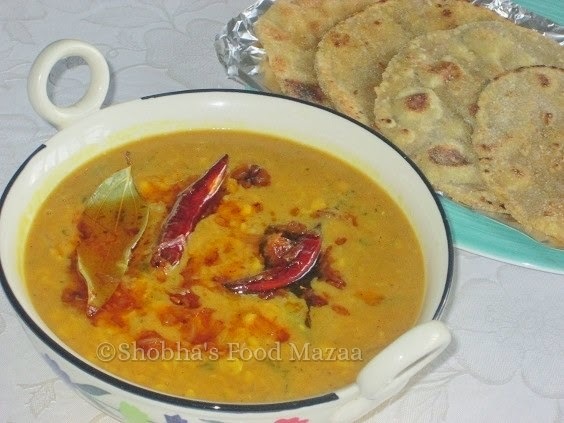 This stew can even be relished without any roti or bread. I sometimes take a bowl full for lunch and it is quite filling. 1. Cut all the vegetables into small pieces and soak the moong gram. 2. Heat oil in a pressure cooker and add the oats. Saute for a minute on low flame. 3. Now tip in the onion, tomato, chilli and all the vegetables and the soaked green gram. 5. Add 2 cups of water and close the cooker. Cook for 4-5 whistles. 6. After opening the cooker, just give a gentle mash with a ladle/spoon and check for the salt. I have served it with dinner rolls.. even garlic bread goes well with it. 1. Select a fish without bones. Clean the fillet. 3. Grind it to a paste and add the lemon juice. 4. 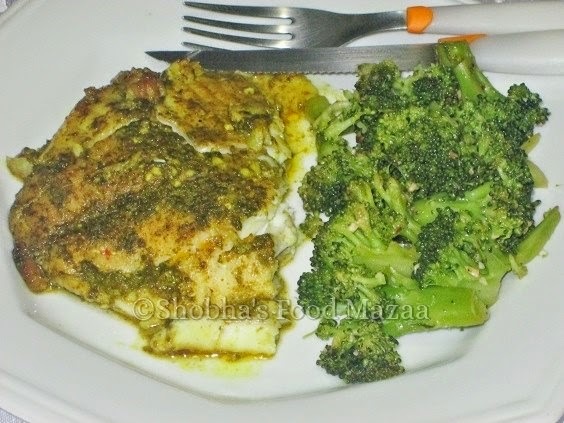 Marinate the fish fillet with the spinach puree. 5. Grease the baking tray or oven proof dish and place the fish fillet. Grill it for 20-25 minutes or until done. Serve it hot with boiled vegetables or salad or garlic bread. I have served with broccoli stir-fried with garlic. Note: The grilling time may vary according to the size of the fish and the type of the oven.